I guess I should try to answer your last two letters the best I can. Your letters are very welcome here, even if you don’t agree with us in everything. I wish we could comfort you better, and wish people would understand us better. I believe we should obey our Heavenly Father above anybody else. I believe if we knowingly disobey God in order to obey people, we are putting man above God and loving man more than Christ, which would be idolatry. See what happened to Saul when he feared the people, and obeyed their voice; thereby transgressing the commandment of the Lord. Please read 1 Samuel 15:19-24; Exodus 23:2; Matthew 10:37; John 14:15. I don’t want to judge anybody with this. There may be many people who serve God the best they know with all their heart, even if they see things different than we do. We make many mistakes ourselves. I believe we honor you if we obey God, even if we have to disobey you. If we would disobey God in order to obey you, we would be dishonoring you and God. Read 2 Chronicles 30:7-9; 34:21. I have not been able to find such texts. I guess you know that the German Bibles don’t all read the same about the Sabbath and first day of the week in the New Testament. It’s clear to me that Baron Carl Hildebrand changed that in the Martin Luther Bibles which he re-wrote. In front of the large German Bible it says that Carl Hildebrand re-wrote most of the German Martin Luther Bibles, and in front of the large print German New Testament is the story about him doing it. I believe you are using the Bibles that were re-written by Baron Carl Hildebrand to try to make it look like the Sabbath has been changed from Saturday to Sunday by Christ or the apostles. I believe the beast in Daniel 7:23-25 intended to change the Sabbath from Saturday to Sunday. There is a table in front of the large German Bible on page 21 that lays this beast out as the Roman Catholic Papal system. The Catholics themselves say they have changed the Sabbath from Saturday to Sunday. We have the Convert’s Catechism of Catholic Doctrine which shows that they have intended to change God’s Ten Commandments. They have done away with the second commandment and divided the tenth in two, so they still have ten commandments. They have questions and answers in this catechism, and this is what they say about their third commandment. A. 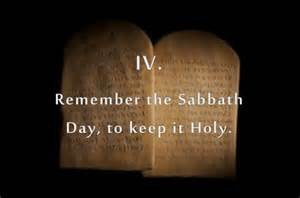 The third commandment is: Remember that thou keep holy the Sabbath day. A. The Church substituted Sunday for Saturday by the plentitude of that divine power which Jesus Christ bestowed upon her. A. The third commandment commands us to sanctify Sunday as the Lord’s Day. Q. What does the third commandment forbid? A. The third commandment forbids (1) The omission of prayer and divine worship; (2) All unnecessary servile work; (3) Whatever hinders the keeping of the Lord’s Day holy. Q. Is the desecration of the Lord’s Day a grievous matter? A. The desecration of the Lord’s Day is a grievous matter in itself, though it admits of light matter. I think the Martin Luther Bibles which were re-written by Baron Carl Hildebrand could be very confusing to some people because he put “the first day of the week” in as “the Sabbath or Sabbather” in some places in the New Testament. I have not found any other versions that read that way; not even the Greek and not all the German Bibles. ______ wrote to me one time saying that all the German Bibles that he sells were originally written by Martin Luther but later re-written by three different people. Many people have talked to us saying Jesus or the Apostles have changed the Sabbath. But we have never found such Scripture, or anything to give us an excuse not to keep the seventh-day Sabbath and now keep the first days as the Sabbath. Our understanding is that the Messiah was crucified on Friday, rested in the tomb over the Sabbath and rose again on Sunday. In Mark 15:42 to 16:6 it looks like He was buried the day before the Sabbath and rose again the day after the Sabbath, and the women bought sweet spices that they might come and anoint Him on the first day of the week, so they evidently did not keep Sunday holy. Luke 23:54 also shows that He was buried on the preparation day, and the Sabbath drew on. And verse 56 shows that they kept the Sabbath day according to the commandment. Then on the first day of the week the women came with the spices, but He was already risen. John 19:14 shows that Jesus was before Pilate on the preparation day; verse 30, 31 that He died on the preparation day. Luke 23:54 shows the Sabbath to be the day after the preparation day; then He rose the day after the Sabbath. I don’t find anything in John 20:19 that the disciples were assembled for worship or for honoring Christ’s resurrection or for honoring a new Sabbath. In Acts 20:7 there is record of the disciples coming together to break bread and Paul preached to them till midnight. Since this gathering was in the night, it must have been Saturday night, as the days change in the evening. (See Leviticus 23:32) Sunday night would have been the second day of the week. To my understanding Paul went for a long journey by foot that same day, still being the first day of the week. If Acts 20:7 gives us an excuse to keep Sunday holy, what should we do about the other days mentioned in Acts 2:46, 47 and Acts 1:15? I don’t see any Sunday holiness in 1 Corinthians 16:2 either. I believe Paul was actually telling them to work upon the first day of the week, gathering things for the poor people in Jerusalem. If we want to cease from our own works, as God did from His, then we should try to rest on the same day as God did. I believe some laws came to an end, like eye for eye, tooth for tooth, circumcision of the flesh, animal sacrifices, meat or drink offerings, holydays, new moons and yearly sabbaths, some of which were a shadow of Christ. Taking a complete concordance and carefully reading every verse in the Bible about the weekly Sabbath, I could not see that it was ever to change or come to an end; nor was it a shadow of Christ as it was given before man sinned. Many people say the fourth commandment has been changed or done away with. But the Saviour said, “Think not that I am come to destroy the law, or the prophets: I am not come to destroy, but to fulfil. For verily I say unto you, Till heaven and earth pass, one jot or one tittle shall in no wise pass from the law, till all be fulfilled. Whosoever therefore shall break one of these least commandments, and shall teach men so, he shall be called the least in the kingdom of heaven: but whosoever shall do and teach them, the same shall be called great in the kingdom of heaven.” (Matthew 5:17-19) Also read Ecclesiastes 3:14; Revelation 22:18, 19; Deuteronomy 12:32. Yes, our forefathers kept Sunday for a long time and may have been better in the spirit than we are, because they may not have been aware of the true Bible Sabbath. “Therefore to him that knoweth to do good, and doeth it not, to him it is sin.” (James 4:17) Should we now have the forefathers as our guide or the Bible? Different places in Bible times, people lost some of God’s laws for centuries but, when they were shown their mistake, they changed and obeyed God’s commandments if they chose to be God’s true people. Hezekiah and Josiah are a few examples in the Bible that we should have the Scriptures as our guide and not our forefathers. Read 2 Kings 18:1-7 and 2 Kings chapters 22 and 23. The following are more examples that we should not just follow our forefathers, church, leaders, or our own thoughts, but we should have God’s Word (the Scriptures) as our guide: Jeremiah 3:25; 9:12-25; 13:10, 16, 17; 16:10-13; 17:5-8, 21-27; 18:11, 12, 18. I believe God is pleased with you, this church and our forefathers, if people do the best they know. But not wanting to know is all different and very dangerous. Read Hosea 4:6; Proverbs 28:9; Isaiah 30:9-13. Are we keeping the Sabbath proper and faithfully if we don’t keep the day that God blessed and sanctified and told us to keep it holy? Can anybody reverse the blessing that God has put on the seventh day? “God is not a man, that he should lie; neither the son of man, that he should repent: hath he said, and shall he not do it? or hath he spoken, and shall he not make it good? Behold, I have received commandment to bless: and he hath blessed; and I cannot reverse it.” (Numbers 23:19-20) “For thou blessest, O LORD, and it shall be blessed for ever. (1 Chronicles 17:27) How do you know that you are not shunning us for keeping God’s commandments? Please read John 16:2, 3. Yes, we realize that our parents, siblings and church feel grieved about us, and that really made it hard for us to make this change. Just to please our own will, we would not have made this change. But because of our love for our Heavenly Father we want to keep all His laws and commandments and try to do all His will. I believe we are very weak in doing all His will and we cannot please Him with our own strength. We need to rely on God for our strenth in doing His will. We are probably making mistakes and still don’t understand all His laws and commandments that we should keep. Please show us clearly, out of the Scriptures, that we are sinning to keep the Sabbath on Saturday and we will recant if you can show us that. Where did the church have a true witness to ban us? They of course all voted in agreement to ban us, but did the Scriptures show them that we are in open sin? If so, then please show us clearly from the Bible. Remember that we are not pushing anybody to do what we are doing. We sometimes feel lonely that nobody agrees with us, which may be good for us. It may help us to realize that we are dust of the earth. I wish we would have explained our beliefs better to the preachers. I will still say, God’s blessings are in this church and probably in every church. But that doesn’t make it so perfect that we should have a church for our guide instead of the Bible. We are not perfect either and I would not want anybody to follow us in disobedience to God. If everybody would have just kept what their forefathers taught them, since before the Reformation, we would all be Roman Catholic. I have never found the Bible saying the Lord’s day is the first day of the week. We love the Amish people and did not want to leave them, but were put out. The Sabbath question has really bothered me for around 2 ½ years before we started keeping it. When I saw in Leviticus 23:32 that God said, from even unto even, shall ye celebrate your Sabbath, that makes me wonder why we don’t keep the days from evening to evening. Then I looked in the dictionary about the days of the week, and it really shocked me that the dictionary says: Saturday is the seventh day of the week. That got us to search more and more if that is really true. Much more evidence shows that Saturday is the seventh day of the week. The prayers in the Lust Gärtlein for each day of the week, the Handwörter-buch, Büchners Hand Concordance, Bible Dictionaries, Encyclopedias, Dr. L. E. Buch, the calendars, German calendar and what I have already mentioned in the Bible and dictionary all agree that Saturday is the seventh day of the week. We had not planned ahead when we were going to make this change, until we could no longer continue to work on the day that we believe to be the Sabbath, without a very troubled conscience. Please pray for us. Best wishes from son _______. ?